Things aren’t particularly easy Blackburn boss Steve Kean at the moment – what with the woeful form, the endless undermining questions, nigh-on all of your own fans not being able to stand you and the niggling fact that you could wake to find your chicken-stained P45 on the doormat on any given morning. Go on, have a flutter. 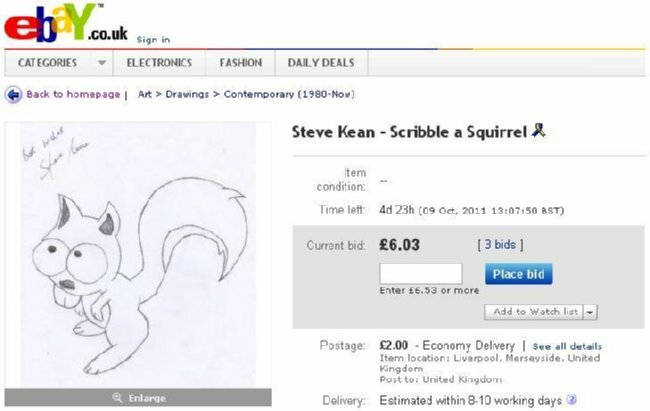 Bag yourself a Steve Kean original before he disappears forever. He’s better at drawing than he’s at management…and that’s not saying much. Gone up to £52. That could buy you a brand new Jon Stead.